I’ve absolutely been anticipating this movie. While THE AVENGERS was not a comic book series I was into during my brief early-teen comic book years, I thought the prequel movies were good introductions, and this team movie had a lot of potential. The actors on board are all guys and gals I like to watch on screen, and the premise (with inter-galactic war being the thrust) was certainly large scale. Liz and I headed out to the theater to see if it could live up to its considerable hype, which includes having the largest US box office opening in history (at least until the third Batman comes out). 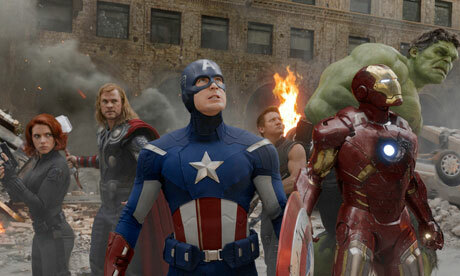 I watched THE AVENGERS (2012) on 5.9.12. It was my first viewing of the film. I was hoping for a largely entertaining blockbuster. THE AVENGERS absolutely lived up to that hope. What I did not expect is how smartly put together this movie is. Thematically there is not much here. Some bits about ego and how society is perceived by its various members. So when I say its well put together, I am not speaking about theme. But in terms of the script structure and how these super heroes are all inserted into the film world, this was brilliantly realized. With X-MEN, everyone is a mutant. Yes they have varying skills, and those skills need to be mixed and matched, but everyone starts on a fairly level playing field. In AVENGERS, we have everything from a nearly invincible God in Thor, to a human with soldierly skills in Black Widow. How do you put these people together in a way that everyone can contribute importantly and believably. The answer lies in the building of faults. Iron Man has an ego and does not want to play together. Captain America is an idealist who looks for everyone to be a good soldier. Hulk is uncontrollable. Thor is more concerned about stopping his villainous brother Loki than with other trivial Earth matters. Bullseye is turned evil. Black Widow is a mere human. Plus none of them really get along, and none of them trust each other. Much of the conflict in this occurs between teammates before the real bad guys ever become a factor. The climactic battle involves the Avengers finally assembling as a team as they battle Loki and an alien race invading Earth. Most every super hero movie which tries to go the space-invasion route ultimately feels trite. Somehow, THE AVENGERS manages to create a universe where this feels logical, and where the invasion doesn’t lead to eye rolling. If Christopher Nolan has perfected the ‘real world’ super hero formula with his Batman series, then writer/director Joss Whedon deserves a ton of credit for making the best fantasy world super hero movie yet with THE AVENGERS. There are so many fun moments. When Iron Man first shows up to help Captain America, I got goose bumps. The battles among the heroes are brutal and well realized. The moment when Stark, Banner, and Rogers first realize something is amiss proves the dialogue scenes are as good or better as the action scenes. A moment with Hulk and Loki at the end is hilarious. Any problems? Sure. Banner seems to instantly be able to control Hulk after much time is spent talking about how he can not, and no particular catalyst seems to lead to his new found control. Black Widow has a moment where she flies an alien machine which feels forced. But mostly, the big moments are well earned. I was down on the Captain America movie, but enjoyed his character immensely here. I was worried about Ed Norton not coming back to play Hulk, but absolutely loved what Mark Ruffalo did with the role. I wasn’t sure how Hawkeye would fare since he only appeared in one scene in the preceding four movies, but the script handled his introduction in a really smart and unexpected way. My minor concerns going in to this film were not only proven wrong, but actually turned into assets. Robert Downey Jr. works as the quarterback of the cast, even if Chris Evans as Captain America eventually assumes the leadership role in the world of the film. It is Downey which controls pace, finds the beats, feels like a veteran. His presence commands attention, and he gives us no choice but to have a ton of fun. I really enjoyed the grandeur of this movie. It is as large scale as movies get, and the CGI delivers. There is a moment in the final battle as the camera pans from one hero to another seamlessly. So many movies get this wrong, and the effects deteriorate into inconceivability. I loved what this movie did with the CGI, the proper care and love was given to the effects. I loved watching this, and can’t wait for the next one. I hope Whedon comes back, all the actors come back, and they somehow take it a step further. I am going to be quite ok with smaller scale IRON MAN and THOR sequels if the future AVENGERS movies are all this epic! Bonus point for the exceptional CGI. Excellent, nuanced work. ~ by johnlink00 on May 10, 2012.